Muslim Advocacy Day – A Comprehensive Report (video and pictures)From Florida | the "silent" majority no more! ← President “Hussein” signs Exec Order for a Council on Women and Girls?!!!! 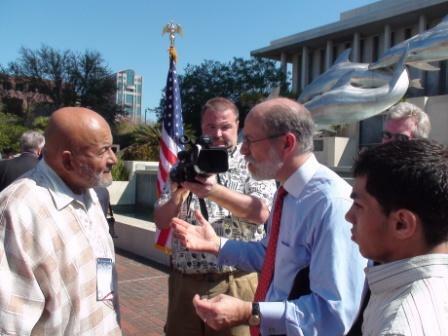 CLICK HERE: Details of Ahmed Bedier’s Muslim Advocacy Day – SEE MUSLIM DAY PHOTOS! Notwithstanding the right of UVA to petition and participate in government, it is also the responsibility of informed Americans to notify elected officials as to who Ahmed Bedier really is and what he actually believes. 1. BRIEFING PACKET — Documentation of Bedier’s terrorist relations, complied in a packet, delivered to every Florida legislator. 2. PRESS CONFERENCE – Assemble high-caliber team to ALERT Florida officials to Bedier involvement with terror-related organizations and individuals. 4. EDUCATION — Begin comprehensive educational program of Florida officials using anti-sharia material including documentaries like; THIRD JIHAD and HOMEGROWN JIHAD. 5. INVESTIGATION – Launch investigative effort to publicize political activities of Ahmed Bedier. On March 9-10, a group with radical Islamist ties will be entering Tallahassee in an attempt to influence Florida legislators, cabinet members and staff. The organization goes by the name – United Voices for America. United Voices for America has every right to come to Tallahassee and request a meeting with you, a Florida elected official. By the same account, you have every right to know that the person sitting across from you is part of a group led by someone who has a set of beliefs that are completely inconsistent with the principles of American Democracy and that are potentially destructive to the State of Florida. Do not let the patriotic name fool you. This is a group that is led by a known extremist with well documented ties to terrorist groups and terrorist supporters. The President of United Voices for America is Ahmed Bedier. Up until May of 2008, Mr. Bedier was the Executive Director of the Tampa chapter of the Council on American-Islamic Relations (CAIR). Prior to that, he served as the Communications Director for CAIR-Florida. CAIR, if you don’t already know, was created by operatives from HAMAS, a Foreign Terrorist Organization listed in Section 219 of the American Immigration and Nationality Act. CAIR was named as an unindicted co-conspirator by the Justice Department in a 2008 federal trial dealing with the financing of millions of dollars to Hamas. Because of this connection to Hamas, the FBI recently issued a directive to all of its field offices stating that none of them were to hold meetings with CAIR or any of the group’s local chapters around the country. Bedier joined CAIR in February of 2003, the same month that University of South Florida (USF) professor Sami Al-Arian was taken into custody by the FBI for his leadership role in Palestinian Islamic Jihad (PIJ). This was no mere coincidence. Through CAIR, Bedier became Al-Arian’s “unofficial spokesman” in the media. He held press conferences for Al-Arian, he attended rallies for Al-Arian, and he used a radio show that he co-hosts to provide a forum for Al-Arian’s PIJ colleagues. In light of this information and the detailed documentation in this Briefing Pack, we ask that you do not give United Voices for America any of your attention. Though it may state otherwise, given its radical leadership, you must understand that ultimately this organization is not in town for any positive reason whatsoever. While the majority of the Muslim community in our state are productive citizens and do not get involved in extremist causes, United Voices for America and its leader are not representative of those Muslims. Finally, we ask that you please be suspicious of this group’s message, no matter how innocuous it seems or sounds. Ultimately, the group’s agenda will do harm to life in Florida and America. The following signatories are simply a group of – Americans Concerned for Florida. We are a cross section of leaders from Florida and various parts of the United States who have joined together to alert the State of Florida to Ahmed Bedier and his new organization United Voices for America. Greg Tighe – President – The Endicott Group, Inc.
Pendra Lee Snyder – President – Citizens Media Group, Inc.
William P. McKay – Manager – The Clifton Corp.
Representative Adam Hasner, House Majority Leader. Tom Trento, Director, Florida Security Council; involved in the promotion and distribution of 28 million copies of the documentary, Obsession, Radical Islam’s War Against the West. Joe Kaufman, Chairman, Americans Against Hate; an expert on many Islamist organizations including CAIR. Dr. Richard M. Swier, Publisher of Red County — Florida; a decorated Vietnam Veteran is a retired Lieutenant Colonel, specializes in National Security issues. Martin J. Mawyer; is the president and founder of Christian Action Network, a non-profit organization dedicated to protecting the traditions of the American family and defending the nation against radical Islam. Mawyer recently produced a powerful documentary (Homegrown Jihad) that uncovered 35 terrorist camps, within the borders of the United States. Kelly Cook, National Field Director with Brigitte Gabriel’s Act for America; Cook directs a grassroots team of over 54,000 members,(5100 in Florida) in 270 chapters. ACT is on pace for 1 million members and 1500 chapters world-wide by winter of 2012. Jerry Gordon; Intelligence Analyst; former Army Intelligence officer who served during the Viet Nam era. Mr. Gordon has published widely in such outlets as FrontPageMagazine, The American Thinker, WorldNetDaily, ChronWatch, The New English Review, Israpundit and others. He has been a frequent guest discussing Middle East issues on radio in both the U.S. and Canada. He is a graduate of both Boston and Columbia Universities. Frank Gaffney, President, Center for Security Policy; Gaffney is the Founder and President of the Center for Security Policy in Washington, D.C.
Frank Gaffney making a point! The organizer of a day that brought nearly 200 Florida Muslims to the state Capitol to lobby politicians Tuesday was called a “known terrorist sympathizer” by a head lawmaker and others, a label the leader emphatically rejected. House Majority Leader Adam Hasner said his colleagues should learn more about the head of Tampa-based United Voices For America before deciding whether to meet with any of the men and women at the Capitol for Florida Capitol Muslim Day. The group is about a year old and has four staff members and about 100 volunteers around the state. It had urged Muslims to come to talk to lawmakers about education and health care issues. Hasner, R-Delray Beach, was talking about Ahmed Bedier, United Voices For America’s executive director. Before starting the group he was the executive director of the Tampa office of the Council on American-Islamic Relations, or CAIR. The Washington-based group was founded in 1994 and has offices in 20 states. Recently the organization was one of hundreds of Muslim individuals and groups named as unindicted co-conspirators in a terrorism-financing trial where a Texas charity was accused of helping fund Hamas. CAIR is fighting the label in court. “I’ve repeatedly spoken out against terrorists,” Bedier said, adding too that CAIR was not the organization at the Capitol on Tuesday. “This is a distraction from his real motive of disenfranchising minority participants, Muslims, from participating in the political process,” Bedier said. Bedier pointed to comments made in 2006 by the head of the Tampa office of the FBI who thanked him for an “open line of communication” between the agency and CAIR. Hasner and other speakers at the afternoon news conference pointed to what they called Bedier’s role as an “unofficial spokesman” for Sami Al-Arian, a former computer science professor at Tampa’s University of South Florida once accused of being a leading Palestinian terrorist. Al-Arian, acquitted of many charges, later agreed to a plea bargain on others and was sentenced to nearly five years in prison. CAIR had supported Al-Arian during the time Bedier was in Tampa, and he was often quoted on the case. Bedier said Hasner’s comments did not appear to be affecting the actions of other lawmakers, many of whom met with Muslims at the Capitol for the day. Bedier said he expected the group to meet with just under half of all lawmakers. He said he had not heard of any lawmakers turning away people who had come to visit them because of Hasner’s comments. Hasner said he had not been contacted by representatives of United Voices for America and would not say whether he would meet with them if contacted. Lobbying days at the Capitol are not unusual. 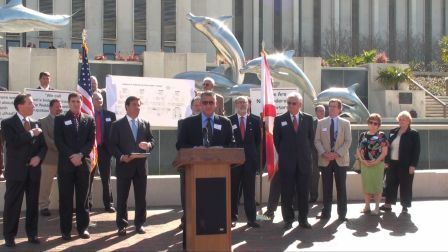 Last week included Space Day, when space-industry groups were in town to meet with lawmakers. Dr. Husain Nagamia from Tampa was one of the people who came to the Capitol for Muslim Day, his first trip to the Legislature. He said he had participated in the discussion of a bill on kidney dialysis, met with three lawmakers and planned to meet with another. “It never crossed my mind that we could enter into a discussion with them. I think it’s a great success for us,” Nagamia said. The response to Ahmed Bedier’s Muslim Advocacy Day was a significant tactical and strategic success that was quickly organized and professionally implemented. As we have continually stated, every Floridian has a right to petition their government, even Muslims being led astray by Mr. Bedier. Hopefully, Mr. Bedier would agree that every American has the right to criticize Mr. Bedier and ALERT Florida officials to serious concerns held by anti-terrorism experts about Mr. Bedier’s associations. 1. The anti-jihad, anti-sharia movement in Florida is a powerful educational force. 2. Citizen Activists are very organized and effectively communicating on a local and national level. 3. Anti-sharia educational programs directed at State officials are increasing on a regular basis. 4. Camaraderie and focus on the task of defeating radical Islamism is superseding ethnic and religious differences. 5. Individual commitment to morally stop any efforts at undermining the US Constitution through a “stealth jihad” methodology is growing on a daily basis, all across Florida and America. 6. Thank God for Statesmen like Rep. Adam Hasner who put principal before politics. We truly believe our stand marked a pivotal moment in American history. As Europeans awaken this morning, they wonder… “what happened?” Sadly we know exactly “what happened,” and have decided to be out in front, protecting and defending the United States Constitution. On behalf of our counter-jihad coalition, please accept our deepest thanks to all who had a part in this important event.